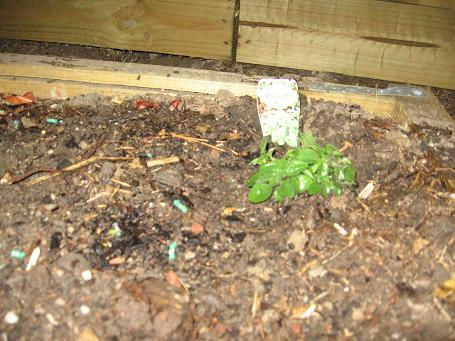 This is just a quick post to say that I finally planted that extra oregano that I bought with my original seedlings. The poor stuff was almost bursting the punnet, I actually had a lot of trouble pulling the plants apart because the root systems had grown so much. Fortunately I grew up watching Peter Cundall every friday night (I can smell fish and chips just thinking about it) and so I knew that I needed to tease the roots out (not be afraid to be rough with them) otherwise they wouldn’t grow down into the ground. 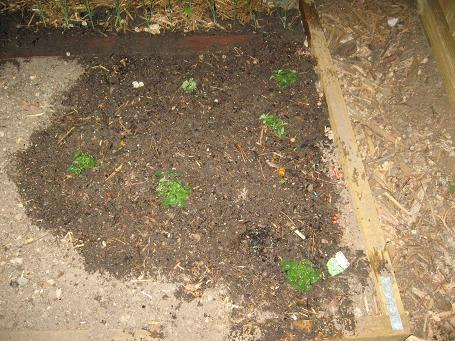 So I planted the oregano, which isn’t all that noteworthy except that it was kinda too hot to do it this afternoon (I didn’t want them to cook straight up), and so I had to do it when I got home from work, ie, after midnight. So I filled my watering can with leftover water and with my phone-torch in my mouth set about my business. You can see in the below photos that the plants are all higgledy. This is not because it was dark, as you can see from the other side, I don’t like one thing to be all together, and so I tried to leave room inbetween for other types of plant. However the photos are a bit crooked cos it was dark and I couldn’t see what the shot was until after I took it. 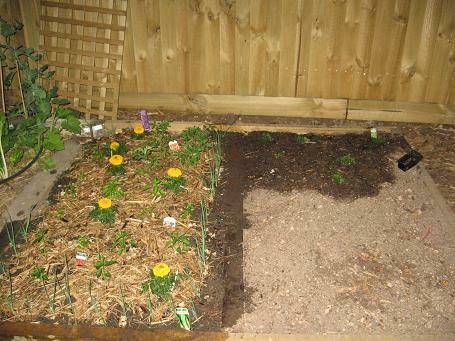 Planting in the dark was good practice for if I ever decide to become a guerrilla gardener. 🙂 I think it would be easier if there were two people, and then one could hold the torch (flashlight). Holding it in my mouth wasn’t ideal. A somewhat skewiff version of both sides – as you can see I have just watered. I will water it again tomorrow morning, and hopefully put some mulch down, in the morning if I have time, otherwise after church. This was an attempt to show the plant and the label, it took a number of goes and I thought this was probably the best one – you can’t really read the label at this low-res.